It's been been through some hard times, but this 1.6K SS is my best Seven yet. In June 1998 (about a year after saying good-bye to Seven number two), number three arrived. 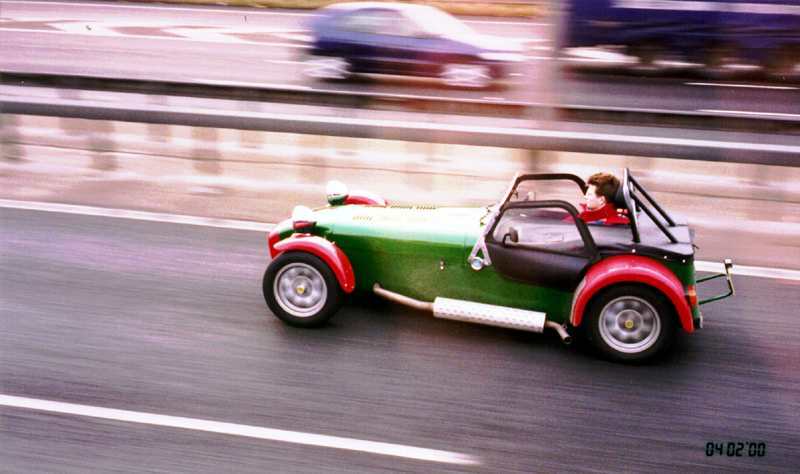 It is a green (not BRG) and red, 1996 de Dion car with cycle wings. It started with a 1600 K-Series SuperSport engine, but was upgraded at the start of 2004 with an 1800 engine estimated to put out around 175 bhp. 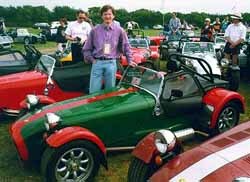 I bought this car privately, and it was my most expensive Seven yet, costing the princely sum of £13950, although at the time this was a very good price for a K-Series car. Here's how the original engine sounded from the passenger seat, whilst accelerating up through the gears. It's in MP3 format, in an effort to keep the file to a reasonable size. Many of the things I've done with this car are covered in the Ramblings section of this site. Here's an index to most of them, but if you're looking for something specific you can always use the search box at the top of the home page. Clash of the Titans at Santa Pod (2000). AP-22 performance meter (arrival, charting, mapping). Fitting a bike computer to a Seven. Trainers I can drive in! Yokohama A032R tyres (end of term report, update for fronts). Freestyle Motorsport handling kit (dampers, springs, front anti-roll bar). New engine (parts 1, 2 and 3). Collateral damage from grounding the sump on Skye. This page is http://www.strangely.org/owned/seven3.html. It was first published on Wednesday 23 April, 2003 and last updated on Thursday 3 November, 2005. Friends: Phil, Steve, Simon, Gwyn, Charles. Weather: BBC Reading, BBC Uxbridge, WC Reading, WC Uxbridge. Search: Google, Yellow Pages, Dictionary, Multimap. Imaging: Steve's Digicams, DC Resource, Imaging Resource, DP Review, Sunday Morning Photographer. Tech: Joel, Cringley, Bricklin, Searls, Udell, WTF. Knowledge management: Beyond Bullets, Confusability, Contentious, Cutting Through, Life With Alacrity. Politics: TheyWorkForYou (Commons debates, Teresa May), Public Whip (Teresa May), Hansard. Copyright © Jason Brown 1999-2007.